May 25, 2018: Can Ohio Lawmakers Have a ‘Constructive Conversation’ On Energy? Or Will a New Governor Need to Speak Up? 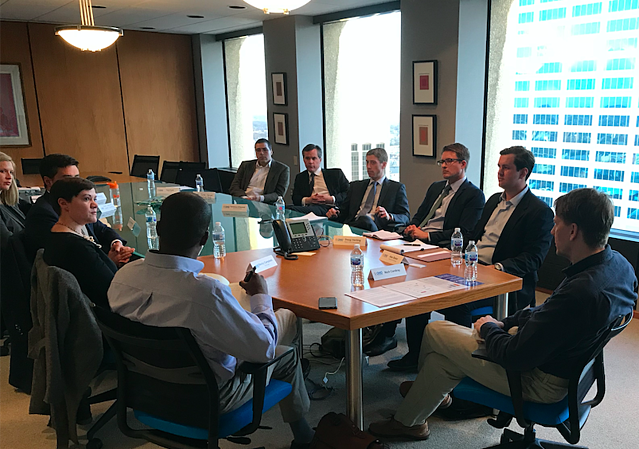 In September, AEE Members and our Ohio team met with Richard Cordray, Democratic gubernatorial candidate, to build support for policies that accelerate the adoption of advanced energy resources and growing the number of good paying jobs in Ohio. The business representatives discussed policy mechanisms and regulatory initiatives that a Cordray administration could utilize to ensure that Ohioans reap the economic benefits and cost savings of advanced energy technologies. Although the advanced energy sector employs 112,000 Ohioans, much more can be done to capture the rapid growth of the industry. Signaling his desire to reset Ohio’s energy trajectory, Cordray outlined the importance of assembling a team of advisors and appointees that would be able to work collaboratively and creatively to reduce barriers that have hindered investment opportunities in Ohio. Cordray outlined how his energy strategy would provide Ohio’s businesses with policy certainty, which has been lacking for the past several years. Columbus, July 26, 2018 — Today, Ohio Advanced Energy Economy (Ohio AEE) announced that Ohio has more than 112,000 people working in advanced energy across the state. This figure represents more workers than in Schools, Colleges, and Training Programs (98,884) and twice as many as those employed at Auto Dealers (49,097). Nationally, the advanced energy industry employs 3.4 million U.S. workers. These figures were released in a fact sheet derived from analysis by national business group Advanced Energy Economy and BW Research Associates of data from the 2018 U.S. Energy and Employment Report published by the National Association of State Energy Officials (NASEO) and the Energy Futures Initiative (EFI) earlier this year, as well as data from the Bureau of Labor Statistics. Energy efficiency led advanced energy employment with 79,700 jobs. Employers expect their advanced energy jobs to grow 5% in 2018. Top 5 counties for advanced energy jobs are: Cuyahoga (14,300), Franklin (13,100), Hamilton (11,800), Summit (5,600), and Montgomery (4,900). Ohio AEE members met with gubernatorial candidates in March, ahead of the state primary. In May, Ohio AEE released a policy roadmap to the gubernatorial campaigns of Democratic nominee Richard Cordray and Republican nominee Mike DeWine outlining how advanced energy can drive economic growth in the state. “Ohio’s next governor has a tremendous opportunity to harness the economic potential of the advanced energy industry to grow the Ohio economy, meet customer demand for clean energy, and create even more high-quality jobs across the state,” said Ted Ford, president of Ohio AEE. Can Ohio Lawmakers Have a ‘Constructive Conversation’ On Energy? Or Will a New Governor Need to Speak Up? Even as Ohioans get ready to elect a new governor, the Ohio legislature is once again struggling to determine whether it will move forward, or backward, on energy policy. More than a year has passed since the Ohio House voted to approve House Bill 114, a bill that would effectively eliminate the state’s renewable energy and energy efficiency standards. Since then, Senate Leaders have worked to develop a compromise that preserves the state’s requirements but reduces them enough to satisfy the House without running afoul of Gov. Kasich, who vetoed lawmakers’ last attempt to gut the state’s RPS and EERS outright. The bill also needs to address the state’s burdensome wind setback requirement, which the Senate tried to fix in the 2017 budget bill. 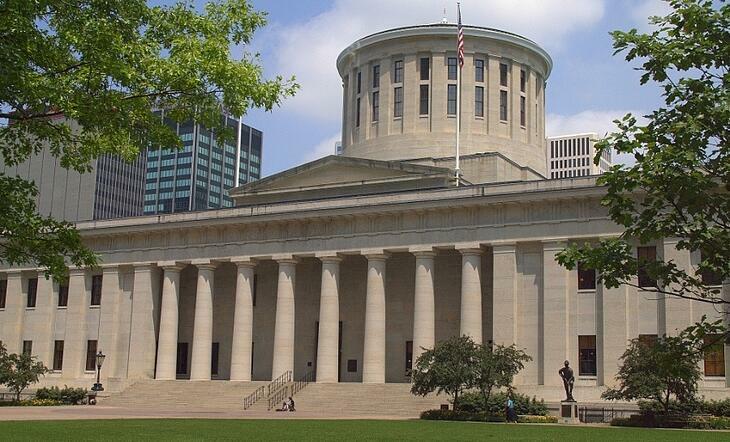 With time running out before the legislature breaks for summer recess, many are wondering – do Ohio lawmakers have the will to reach a constructive deal that finally puts Ohio’s energy policy on a stable course this year? Or will Ohio’s energy future be left to the legislature’s next session – and next governor?. COLUMBUS, May 17, 2018 – Today, Ohio Advanced Energy Economy (Ohio AEE) announced it has delivered a policy roadmap to the Ohio gubernatorial campaigns of Republican nominee Mike DeWine and Democratic nominee Rich Cordray outlining how advanced energy can transform the Ohio economy. The policy roadmap, “Advanced Energy Roadmap for Ohio: How the next governor can capture the economic benefits of diversifying Ohio’s energy portfolio—and drive job creation and economic growth,” outlines key market-based policy considerations that would allow the next governor of Ohio to take advantage of the development and manufacturing of advanced energy resources while also benefitting from the thousands of jobs and billions of investment dollars that come from embracing this growth industry. Stabilize and expand market-based mechanisms to accelerate deployment of innovative, cost-effective renewable energy resources and energy efficiency for all Ohioans. Uncertainty over Ohio’s direction on advanced energy has discouraged investment in the state and hampered the growth of the industry as a whole. Eliminate barriers that prevent Ohio businesses from accessing low-cost wind energy. The current wind setback standards have acted as a de facto moratorium for the wind industry and Ohio continues to lose out on billions of dollars of investment to neighboring states. Removing this government barrier would allow the market to function, driving access to wind energy resources for corporate customers to invest in clean, affordable renewable power within the state. Accelerate adoption of electric vehicles, including commercial fleets, and support charging infrastructure deployment in Ohio. Despite growing national demand, the lack of sufficient charging infrastructure and a supportive regulatory structure remain roadblocks to greater adoption of EVs in Ohio. Remove barriers to investments in technologies and services that reduce energy costs and consumption while increasing customer choices and control. To provide the most value to consumers and the grid, market rules must ensure a competitive market for distributed energy resources (DERs) like wind and solar while aligning the utility business model with consumer interests. Modernize Ohio’s electricity systems by building upon PUCO’s PowerForward initiative to deliver benefits for consumers and enhance grid reliability. As advanced energy deployment increases, Ohio must be prepared to integrate these new and innovative technologies into the existing system and to take advantage of the benefits they can provide. This policy roadmap lays out opportunities each candidate will have to leverage advanced energy policies as economic development tools, securing their legacy as a job-creating governor for the state of Ohio. On March 8, Ohio Advanced Energy Economy (Ohio AEE) sat down with Joe Schiavoni (D-Youngstown), state Senator and former Minority Leader, as we continued our series of meetings with gubernatorial candidates about the economic benefits and significant job growth of advanced energy technologies. This was Ohio AEE’s third in the series, including earlier meetings with Democrat candidate Richard Cordray, former head of the U.S. Consumer Finance Protection Bureau, and Republican Mike DeWine, the state’s Attorney General. As a legislator, Sen. Schiavoni has been a strong advocate for the advanced energy industry, organizing his caucus to vote against legislation that would weaken the state’s renewable and efficiency goals (RPS and EERS). 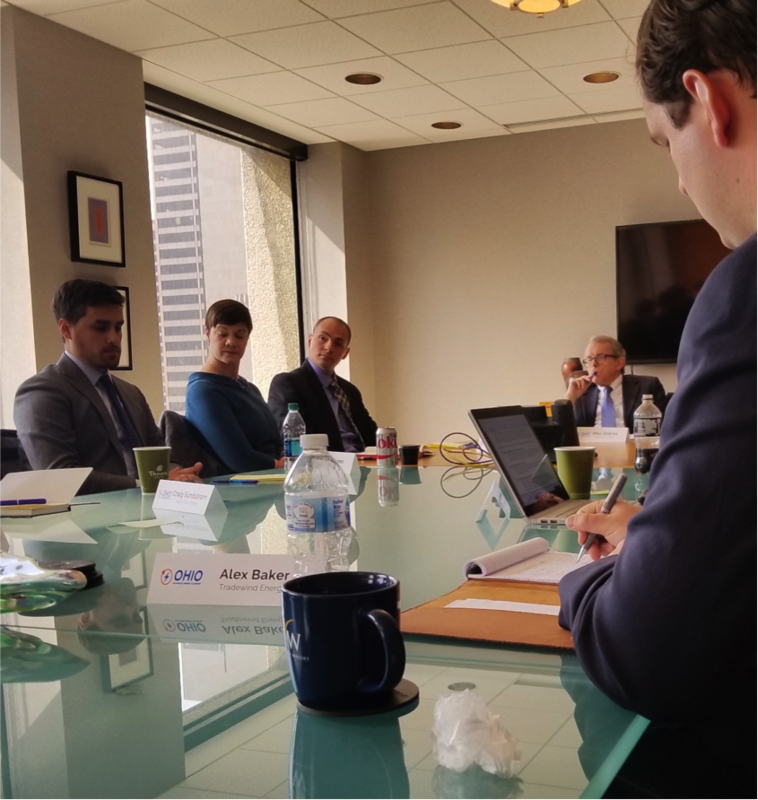 On March 8, Ohio Advanced Energy Economy (Ohio AEE) continued its series of meetings with Ohio gubernatorial hopefuls by sitting down with Attorney General Mike DeWine, the former U.S. Senator, and Republican frontrunner for governor. In our meeting with Attorney General DeWine, a group of 10 companies with representatives from First Solar, Apex Clean Energy, Tradewind Energy, Schneider Electric, and Open Road Renewables among them, discussed the job creation potential associated with advanced energy. In addition, significant cost declines for renewable energy over the last decade (60% for solar and 80% for wind technology), improvement in grid reliability, and economic development that supports local schools in rural areas were key benefits that resonated with DeWine. 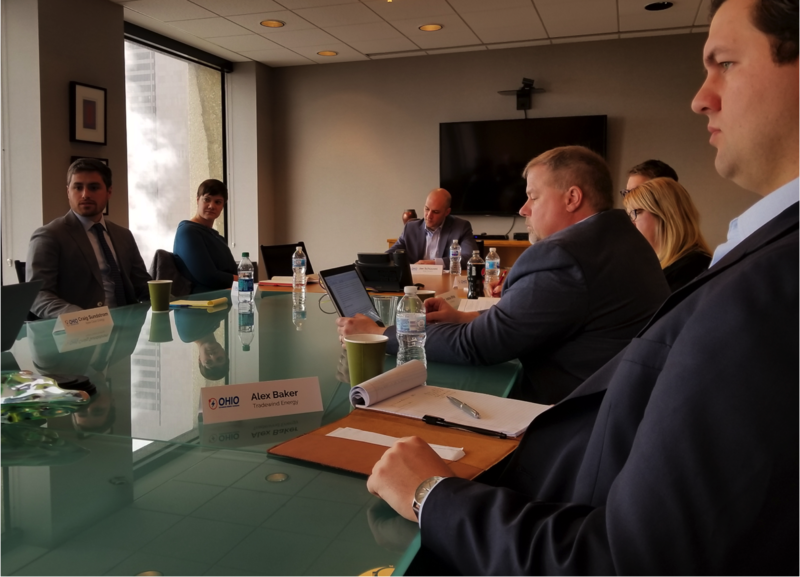 On March 6, Ohio Advanced Energy Economy (Ohio AEE) hosted an engaging roundtable chat with Ohio gubernatorial candidate Richard Cordray, the former Ohio Attorney General who most recently served as director of the U.S. Consumer Financial Protection Bureau. As one participant put it, in this case, the picture does not do justice to the level of interest and engagement by Cordray as he sought to learn more about advanced energy technologies and companies and their impact on the state. He asked a lot of questions and conveyed genuine commitment to and support for expanding clean energy because it’s the right thing to do, it represents the future for Ohioans and we need to embrace it. The roundtable was the first in a series of meetings with the leading candidates for governor being organized by Ohio AEE. Through these roundtables, we hope to learn more about each candidate's vision for the state, and we hope they will learn more about the advanced energy industry that’s growing in Ohio. Ohio voters have spoken - they want clean energy and fast. Another poll released by the Ohio Conservative Energy Forum (GOP voters support green energy, oppose coal, nuclear bailouts, statewide poll finds, Jan. 10) unsurprisingly finds that voters, regardless of political affiliation and income levels, want the state to increase investments in technologies that generate clean energy. Further solidifying energy as a nonpartisan issue but as a significant economic development opportunity, nearly 80 percent of conservative and independent voters would encourage their lawmakers to support policies that take advantage of money-saving energy efficiency and competitive wind and solar. Since the standards were first put in place in 2008, Ohio has created over 105,000 jobs in renewables and energy efficiency. Unfortunately, some Ohio lawmakers are attacking clean energy as costly while embracing a billion-dollar coal and nuclear bailout for profitable utilities that will be paid for by all consumers. Despite the public support, jobs, and economic growth, Ohio's lawmakers continue to undermine Ohio's competitive advantage by weakening its clean energy standards. Will Ohio send a clear message embracing lower cost clean energy and position itself to be a leader in the industry or will legislators learn the hard way in November? Hundreds of millions of dollars in economic investment stay on the sidelines in Ohio due to the most stringent wind setback requirements in the nation. Three years ago, the legislature enacted these setback requirements, and they brought new wind development to a standstill. Today, there is a projected $4.2 billion of wind investments that could be made in Ohio if the legislature would simply act. But the 2017 legislative session has seen a series of starts and stops for advocates and legislators looking for a wind setback fix. The first opportunity for a fix was presented by the state budget, with proponents including AEE, AWEA, large energy consumers, the Ohio Chamber of Commerce, and others pushing for an amendment to be inserted. After extensive public hearings and legislative debate, the Senate included an amendment returning wind setback requirements to their previous, and sensible, levels in its version of the budget. Columbus, Ohio, December 6, 2017 — Today, a group of Ohio healthcare providers and advanced energy companies released a letter calling on lawmakers to support a “comprehensive approach to Ohio’s energy policy” that would “value innovative technologies that institute energy efficiency and demand response as a resource and expand the deployment of advanced energy technologies that curb energy costs to consumers.” Signers of the letter include the Cleveland Clinic, the Ohio Hospital Association Energy and Sustainability Program, and CEOs of Mercy Health, Mount Carmel Health System, and Tri-Health. Advanced energy business leaders signing the letter include executives from First Solar, Apex Clean Energy, Siemens, and Melink Corp. Specifically, the letter warns against efforts to weaken the state’s commitment to renewable energy and energy efficiency investments, as well as putting barriers in the way of renewable energy growth, such as the state’s overly restrictive setback requirements for wind energy developments. Over the past five years, Ohio lawmakers have been pursuing changes in state law that undermine investments in advanced energy technologies. This uncertainty has created hesitation among investors that are eager to bring jobs and economic growth to Ohio. Three years ago, the Ohio General Assembly enacted the most restrictive wind turbine siting requirements in the nation, bringing most new wind development in the state to a standstill. Although industry leaders warned of the potential consequences, the new setback language was inserted into a budget bill – with no testimony or debate – and signed by the Governor. With nearly $4.2 billion of wind investments at stake, it’s time to roll back Ohio’s wind setback. Unfortunately, Ohio lawmakers let one opportunity to restore balance to wind siting slip away. Now, the best shot they have is a legislative vehicle full of danger for the advanced energy industry. Cincinnati, Ohio, April 27, 2017 — Today, Advanced Energy Economy Institute (AEE Institute) convened a discussion with Ohio’s leading commercial and industrial energy managers, efficiency program and service providers, city officials, and thought leaders to share their experiences implementing effective energy efficiency programs. These conversations allow stakeholders to learn from efficiency leaders and help shape Ohio's policies to enhance the state's energy productivity for competitiveness and economic growth. For today’s roundtable, AEE Institute brought together 12 energy efficiency experts to discuss the opportunities and challenges for industrial efficiency in Ohio. This roundtable was hosted by Melink Corp. in Milford (part of greater Cincinnati), a leader in building energy efficiency and solar energy development. Participants included companies like Siemens, Cooper Tires, and Energy Optimizers, USA, among others. The discussion highlighted successful projects completed by energy service companies in Cincinnati and throughout Ohio that have helped industrial customers, typically large energy users, make their facilities more efficient and competitive, significantly reducing their cost of operations. The industrial sector is the largest user of energy, accounting for 32 percent of total electricity usage in Ohio. Various technologies and services, like demand response and combined heat and power, can make industrial energy use more efficient. While large cities in Ohio continue to make significant progress on energy efficiency, more can be done to help all consumers. Ohio is presented with various opportunities for improving efficiency programs. The group focused primarily on challenges surrounding the industrial efficiency sector, including financing projects, customer awareness, and improving access to data. “Energy efficiency is a valuable resource that allows companies, like ours and our customers, to reduce the cost of energy per unit produced, thereby increasing our competitiveness and the competitiveness of our customers. And when you connect efficiency upgrades with improved data visualization, adaptive technologies, and controls, we are able to make more informed decisions that influence productivity,” said Don Wingate, Vice President Sales - Utility Solutions, Schneider Electric. Energy efficiency represents a significant share of the total $200 billion U.S. advanced energy industry that is equal to pharmaceutical manufacturing revenues and approaching that of consumer electronics, and today employs more than 3.3 million people across the nation. For more information on the role and size of the energy efficiency sector in the United States, download Advanced Energy Economy’s Advanced Energy Now 2017 Market Report. To learn more about various energy efficiency technologies, download This Is Advanced Energy, a comprehensive technology directory with descriptions, photos, and case study examples. Columbus, Ohio, March 30, 2017—Today, national business group Advanced Energy Economy provided the following statement following the passage of HB114 from the Ohio House of Representatives, a bill that is objectively worse for the advanced energy industry than HB554, the bill vetoed by Gov. Kasich last year. According to AEE, HB114 would be a job-killer in Ohio, depriving the state of $10 billion in advanced energy market opportunities created by reinstatement of the state’s renewable energy and energy efficiency standards January 1, as a result of the Governor’s veto. Columbus, Ohio, March 21, 2017—Today, national business group Advanced Energy Economy provided the following statement and testimony about Ohio’s House Public Utilities Committee hearing on House Bill 114, a bill that is considered worse for the advanced energy industry than HB554, the bill vetoed by Gov. Kasich last year. According to AEE, HB114 would be a job-killer in Ohio, depriving the state of $10 billion in advanced energy market opportunities created by reinstatement of the state’s renewable energy and energy efficiency standards January 1, as a result of the Governor’s veto. “As a major employer in northwest Ohio and a center of solar technology innovation, we oppose HB114," said Mike Koralewski, Sr. Vice President of Global Manufacturing at First Solar. "Our Perrysburg facility is the largest solar photovoltaic (PV) module manufacturing site in the United States. House Bill 114 would be a step backward for Ohio, making it more difficult to leverage increasingly competitive, locally manufactured utility-scale solar projects that customers large and small demand in greater numbers every year." Ohio gained national attention in the closing days of lame duck session as the legislature and Gov. John Kasich squared off over the future of state’s energy standards. Despite the Governor’s clear signal that he would veto any extension of the freeze instituted two years ago, the Ohio General Assembly passed HB554, which would have extended the freeze on the state’s energy standards by turning the benchmark requirements into voluntary goals for the state’s utilities through 2019. Despite the efforts of legislative leaders, who sought to pass the bill with veto-proof majorities, the vote fell short of reaching the threshold needed for an override. That set the stage for some end-of-session drama. AEE and Ohio AEE were joined by other organizations and more than 70 businesses to testify in opposition to the bill. Thanks to this strong opposition to the bill, a number of Republican legislators sided with Gov. Kasich and voted against extending the freeze, depriving the bill of veto-proof majorities. Sticking to his principles, Gov. Kasich vetoed the bill on the final day it could be on his desk, and just days before the December 31 expiration of the freeze on the RPS and EERS. With his veto, Gov. Kasich unleashed an advanced energy market opportunity of more than $10 billion – and sent a clear signal to the nation and to our industry that he is ready to fight for sensible energy policy that attracts high-tech companies and saves consumers money. “Gov. Kasich’s decision will help ensure that Ohio can leverage increasingly competitive, locally manufactured utility-scale solar projects that customers large and small demand in greater numbers every year,” said Mike Koralewski, Senior Vice President of Global Manufacturing at First Solar. While many of the original RPS and EERS benchmarks have been reinstated, changes previously made (by SB310 in 2014) are unchanged. These include elimination of the in-state renewable energy purchasing provision, which required 50% of renewables purchased by utilities to come from Ohio generation, and watered-down provisions regarding what counts towards energy efficiency. Finally, the veto of HB 554 does nothing to address the onerous wind setback requirements adopted separately in 2014. Nor has the veto secured Ohio’s advanced energy future. Energy will once again be a top priority for the Governor and Ohio lawmakers in 2017. For starters, leaders in the Republican-controlled House have signaled their intent to resurrect HB 554 in the new session now underway and pass it once more, this time with a veto-proof majority. The primary sponsor, former State Sen. Bill Seitz (now back in the House of Representatives due to term limits), has even threatened to seek a full repeal of the RPS and EERS in 2017. Senate leaders, however, have indicated that they would like to take a more deliberative approach, in hopes of establishing a comprehensive, long-term energy strategy for the state, rather than just pulling the plug on successful energy efficiency and renewable energy standards. This session, the legislature will be looking to address not only the EERS and RPS but also wind setback requirements, as well as deal with calls from First Energy and AEP Ohio for re-regulation of some of their generating assets, possibly including future renewable energy projects. Given that so many of the utilities’ former assets are now owned and operated by independent power producers who compete with them, re-regulation promises to be a major battle. After more than two years of debate on energy, the Governor’s veto of HB 554 could be a turning point for Ohio, but nothing is certain. AEE will continue to advocate strongly for competitive markets and meaningful, enforceable standards to keep Ohio on the path to an advanced energy future. Cleavland's Plain Dealer covered reactions to Gov. Kasich's veto of House Bill 554, including AEE Ohio's. Read the full article here. Greentech Media noted AEE's economic analysis in Ohio and quoted Ted Ford. SNL quoted Ted Ford of AEE Ohio: “While Ohio has been idling, Michigan has attracted over $1.1 billion in renewable energy investments,” he said. “With this veto, Ohio can begin to move forward with sensible energy policy next year” and JR Tolbert of AEE: "Governor Kasich understands that renewable energy and energy efficiency create jobs and save money. That's a formula that is good for business and good for every Ohioan." Sat Press News reported on the veto and also quoted Ford. 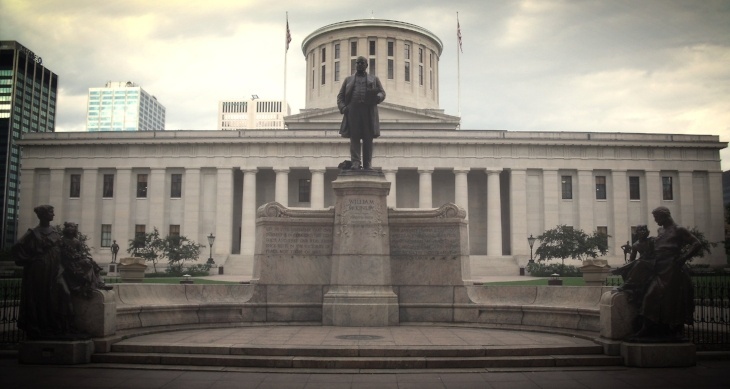 Money News: "AEE and AEE Ohio Applaud Governor Kasich Veto of Bill Weakening the State’s Energy Standards"
Ohio Ag Connection: "AEE Applauds Kasich Veto of Bill Weakening Energy Standards." North American Wind Power: "State Gov. Blocks Bill Passage To End Clean Energy Freeze"
AOL News: "Ohio's GOP governor beaks with party over green energy"
Midwest Energy News: "Ohio clean energy standards resume, but still weakened by 2014 laws"
During the 11th hour of lame duck session, Ohio lawmakers have passed a bill, HB554, that would allow utilities to continue ignoring the state’s renewable energy targets for the next two years. Through modeling work, AEE has demonstrated how Ohio can meet its energy demand cost-effectively through a variety of resources, including renewables and efficiency. “Lawmakers are opting to turn down $3.3 billion in savings for the state and $192 in annual savings for the average household in 2027 by failing to capitalize on advanced energy technologies,” said J.R. Tolbert, AEE’s vice president for state policy. “That’s a real shame. Kasich's veto follows a campaign by environmental, business and consumer groups opposing the legislation. Today, Governor Kasich's principled leadership has given Ohio an opportunity to get back on track," said J.R. Tolbert, vice president for state policy. "He stood behind his commitment to renewable energy and energy efficiency, allowing Ohio to regain its competitive advantage nationally. "Governor Kasich understands that renewable energy and energy efficiency create jobs and save money. That's a formula that is good for business and good for every Ohioan." "The two-year freeze has cost Ohio jobs and investments. In the last three years, while Ohio has been idling, Michigan has attracted over $1.1 billion in renewable energy investments," said Ted Ford, president of Ohio Advanced Energy Economy.